Ok, I must admit that my handwriting (cursive) is terrible ... and getting worse! So, now I discover there is research on the importance of cursive writing and brain development. 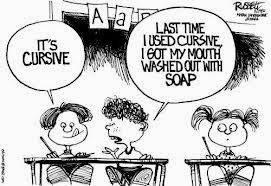 Nancy B. Loughlin wrote a column on it that was headlined Know Thyself: Demise of cursive writing a sad tale . A University of Washington study led by Dr. Virginia Berninger determined that the brain and the hand working together to execute the strokes of individual letters activates the areas of the brain dedicated to thinking, memory and language. Selecting a key on a board doesn’t. On a more esoteric level, cursive handwriting reflects self, the swift connectedness of the letters a portal to the subconscious mind. Unlike the starts and stops of print, the conscious mind has less opportunity to control the pen because cursive flows. Your signature is your self-portrait. Interestingly, the new common core standards do not include cursive handwriting for elementary students. Clearly, the challenges facing today’s associations require creativity within the overall association management capabilities. It is a vital part of the management equation.